And- the most important part!- You need rosin on the horsehairs of your bow in order to grip the strings as you move the bow in order to make a sound. Without bows, violins would just be plucked. But without rosin, your bow would just be skating across the strings with very little or no sound coming out. No rosin = No sound. Despite its importance, rosin often goes unnoticed and unconsidered. But if you take the time to look into it, rosin becomes fascinating. Even the seemingly simple mechanics of rosin are complex! Before writing this blogpost, I (Ivana) had only a vague idea of how rosin worked. The extent I thought about it was pretty much "rosin makes the bow work". What actually happens, beyond "it makes the bow work", is that powder from the rosin cake sticks to the scale-like formations on the hair of your bow. This is why bows have to be rehaired. As you practice, the "scales" on the surface of the bow hair wears down. Once the surface texture of the hair is gone, the rosin has nothing to stick to, and sound production is much harder. Beyond this basic idea of how rosin works, much is unknown. However, a study done by JH Smith and J Woodhouse supports the hypothesis that a bow with rosin acts similarly to an ice skate. Ice, when kept above −4°F (−20°C), has a thin layer of water. This water reduces the friction between the skate and ice enough to allow for a smooth, gliding motion. Rosin has a "softening" point close to room temperature (it's melting point is close to 100 C), making some scientists believe that it could melt to form a thin layer when it is being drawn across a violin string. However, the friction of a violin bow moving across a string does not melt enough rosin to produce a smooth motion. The motion melts a small amount of rosin, meaning there is more friction. The rosin then grabs the string in the direction of the bow's motion, and when the string is released, it vibrates and produces sound. Electron micrographs of a rosin coated glass rod after being drawn across an E string. This shows that the rosin has partially melted. Rosin sticks to the "outer or dermic coat"
Whatever way rosin works, it really does work! Until it doesn't. Your rosin has to be sticky enough to grab the strings and help you make a sound with your instrument. But, if your rosin is too sticky it feels slow and gums up your strings. If it's not sticky enough, it feels like you're skating across the top of the string and expending a lot of energy for not much sound. So, light, dark, medium, or clear in color? Summer rosin? Winter rosin? Rosin with some type of metal or other fairy dust? What's the difference? For violinists, a light, hard rosin works best for most of the year. Light, hard rosins provide enough grip for violinists without being sticky. In very humid weather, you might need a very hard rosin. In very cold, dry weather, you might need a stickier rosin that's darker, softer, and has more grip. 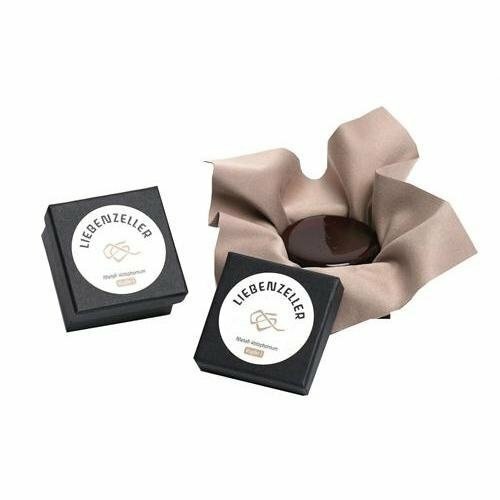 For cellists, you need a darker, stickier rosin for most of the year. In very warm, humid weather your dark, sticker rosin might be too sticky. Switch to a lighter, harder rosin. But not too light and hard or you won't get any grip on the strings. For violists, you need something in between. Luckily, Melos makes a viola rosin that works great! Melos viola rosin is the very essence of medium. Medium hardness and medium in color. So, it also works great for violinists in the dead of winter and cellists in the heat of summer. Why do you need different rosins depending on the season and the humidity? One major reason is that rosin is hydrophilic. That is, it absorbs water from the atmosphere. In very humid weather, the rosin on your bow will absorb water from the air around you and become stickier. The harder the rosin, the less stickiness it will have. The softer the rosin, the more stickiness it will have. To play well, you need to strike a balance- you rosin needs to be sticky enough to grab the string, but not so sticky that it feels like you're trying to push your bow through a pile of wet slush. The way, and the time of year, that rosin is made has a huge impact on the way the rosin works. The base of all rosins is resin, which is tapped from many varieties of pine trees in a similar fashion to maple syrup tapping. After it is tapped, the resin is heated and separated from by-products. Depending on the maker, the resin may be mixed with other tree saps in a "secret formula". It is then poured into molds, polished and sold. This basic process is applicable to all rosins, but the product's properties can differ. Resin from a Merkus Pine in Indonesia. Not a pine variety used to make rosin, but the resin looks similar. Rosins can be different clarity, color, and hardnesses. The clarity of a rosin is a large factor in determining the price. Pretty simply, the clearer the rosin, the higher the price. Color and hardness are more complicated. Often, these factors are linked, but differences can be caused by a variety of factors. Generally, resin collected from trees in late winter or early spring will be harder and lighter colored, while resin collected from trees in summer and fall will be softer and darker colored. Conversely, musicians should use use harder, lighter colored rosins in the summer and softer, darker colored rosins in the winter! However, impurities like iron, "secret formula" ingredients, and the temperature that the rosin was "cooked" at can affect color as well. This means that some companies add coloring to indicate differences in hardness, or simply to make the product prettier. In any case, color is not always an indication of the stickiness or properties of a rosin. Melos light rosin on top, and dark rosin on bottom. The darker rosin, in this case, is stickier. One of the big additives or "fairy dust" ingredients that rosin companies like to market are metals. Gold is said to give a soloist sound, silver is said to give a bright sound, and copper is said to give a warm sound. However, I'd like to warn you away from any rosin that has any type of metal dust in it. While it might make the rosin work better (and that's a BIG MAYBE), breathing in any type of metal dust, including gold and silver, is not good for your lungs, nose and airways in between. When you bow, your nose and mouth are very close to the bridge area. You'll be breathing in rosin dust and all the components that have been added to that rosin. You don't want to be breathing in gold, silver, or some other metal's dust on a regular basis. Also, I think that any of the metal dusts (gold, silver, copper, etc.) wear out your bow hair faster because they leave a microscopic metal debris field on your string. The Melos rosin website has some wonderful pictures of their rosin production, which takes place in Greece. Check them out here. So now that you know more about rosin then you possibly ever wanted to know---- What rosin will work best for you??? All we can do is give you our recommendations and why we like what we like. 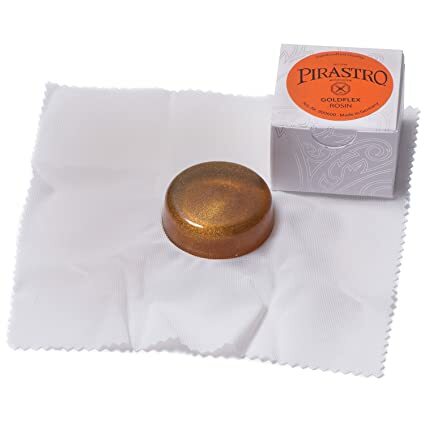 Our first recommendation is a tie- We love Magic Rosin and we love Melos Rosin. Both rosins are made by professional cellists- Minnesota cellist Sarah West developed Magic Rosin and Greek cellist Christos Sykiotis develpped Melos Rosin. Magic Rosin is clear, so it's hard to call any of the rosins dark or light. But, the '3G' has the playing feel of a light, hard rosin. Their 'Ultra' rosin is stickier and has the playing feel of a dark rosin. We use the '3G' for violins and violas, the 'Ultra' for cellos. Our late office manager, Amy Tobin, wrote a review for Magic Rosin extolling it's addictive nature for a string player. Once you start using Magic Rosin, it's hard to stop using it! 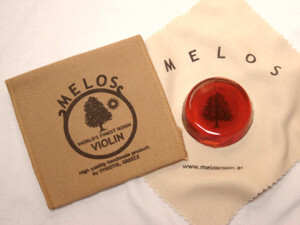 Melos rosin comes in light and dark rosins for violin, viola, and cello. A viola specific rosin in both light and dark! That's rare! All of the Melos rosins have a very smooth, consistent feel to them. Christos is a warm and friendly guy- he's sent us postcards from Greece telling us how much he's grateful that string players are making beautiful music with his rosin. Somehow, his rosin seems to embody that warm and gracious personality. Beyond those two rosin makers, Hill Rosin has been a standard for years. We like AB rosin (seems extremely similar to Hill rosin but without an inflated price), and Larsen Rosin (especially for cello!). 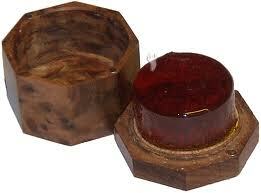 Millant Sartory Rosin comes in a very pretty wood box, but it's very expensive. I don't think it plays much better than other rosins, but it makes a great gift! 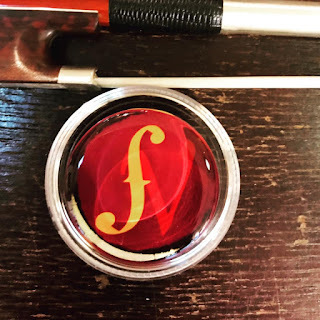 There are a few rosins that tout their extremely high quality (and extremely high price tag) based on some notion that they're producing rosin just as it was produced for Stradivari, Paganini, Tartini, or some other great name in the violin world. But think about how much string technology and instrument set up have changed since those people were playing and making. Unless you're using ancient types of gut strings and playing with an archaic bow form, that rosin is probably not the best for your playing. But, hey! If you think it helps your playing and sound, then by all means use it! Allergic to rosin dust? Many people are! Irish fiddler and chemist Tom Quinn developed Clarity Rosin, a synthetic rosin that's hypoallergenic and works very nicely. Also, Google "Tom Quinn rosin" and you'll find he's a frequent and erudite commentator on discussions about violin rosin. No rosin is magic (even Magic Rosin!). If your bow hair is old, dirty, and worn out, no rosin is going to make it play better. So get your bow rehaired about once a year. More often if you play more than a couple of hours each day. After your bow is rehaired there won't be any rosin on the hairs. We rosin up the bows before we give them back to the client, but not every violin shop does. So, if your fresh hair doesn't make any sound, it's because you need to rosin the fresh hairs. You'll be surprised how much rosining fresh hair needs! How long does a cake of rosin last? By now, you know that most rosin is made from a natural source. As such, it is affected by the environment and daily fluctuation of temperature, sunlight, and humidity. A good rule of thumb is to replace your rosin somewhere between 18 months and 5 years. I have to admit, though, that most of the rosin that we sell is a replacement for a cake that the player dropped and cracked or their dog ate. ( Zev, the shop dog, has never eaten a cake of rosin. I don't think rosin is very toxic to dogs, but it's probably not very good for them either.) Most good rosin is in the range of $10 to $30. Considering what you spend on lessons and the time you spend practicing, a good cake of rosin is really a very inexpensive luxury! Speaking of inexpensive- I don't know how some of the really cheap rosin makes their rosin so bad, but it isn't worth the few bucks you're going to save. Go ahead, get yourself a decent cake of rosin. A last word about words and names. 'Rosin' is the refined product that string players use to rosin their bow hairs. 'Resin' is the name of the raw material that's tapped from pine trees. 'Colophane' is the word for rosin in many languages besides English. Happy bowing! We're happy you stuck with us all the way through this somewhat esoteric article. At our shop we sell these types of rosin- Magic, Melos, AB, and Larsen. We also have wonderful bows rosined up and ready for you to play!